PETROL PRICES IN Ireland have decreased for the first time in six months, according to AA Ireland. On average, a litre of petrol now costs 136.6c, while a litre of diesel costs 126.0c – down from March’s prices of 137.7c and 127.1c per litre respectively. The decrease marks the first time since September 2016 that the price of a litre of petrol has fallen, while diesel has now fallen to its lowest level since the beginning of 2017. Despite the drop in fuel prices, the motoring organisation has expressed concern over the tax levels imposed on fuel spend. 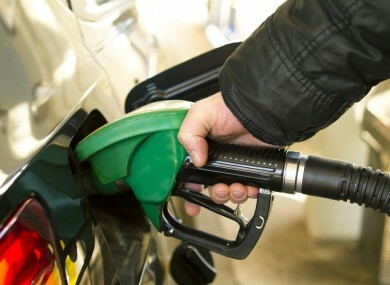 The AA’s fuel prices survey found that tax accounts for 63.18% of the current price of a litre of petrol and 58.30% of the price of a litre of diesel. Faughan said that while the decrease in cost is welcome, it “won’t do much to ease the concerns of motorists who are still paying almost 10 cent a litre more for fuel than they were this time last year”. We are a largely rural country where many motorists drive out of necessity and taxing fuel spend to the extent to which it is currently taxed makes it harder and more expensive for people to get to work. “Instead of facilitating growth by making it easier for people to commute to work, the government is actually taxing fuel to the point where it becomes an anti-stimulus measure,” Faughan added. While fuel prices have dropped on average nationally, the AA’s report notes a significant increase in the cost of a barrel of oil, a key trend in setting fuel prices. The price of a barrel of Brent Crude Oil has risen from below $51 (about €48) to $55.85 (about €52.40) per barrel since March. Email “Petrol prices drop for first time in six months ”. Feedback on “Petrol prices drop for first time in six months ”.